Students show off the fruits of their labor at a Promise of Peace Garden in Dallas. Photos courtesy of Elizabeth Dry. 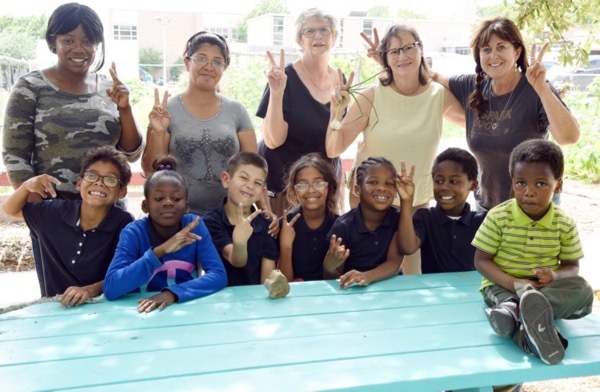 A Dallas nonproft that aims to teach children the value of eating nutritious food, taking care of the environment while building community is still going strong after nearly a decade. Promise of Peace Gardens is one of the finalists for the Green Source DFW Awards. The winners will be announced during the 7th annual Green Source DFW Sustainable Leadership Awards dinner on Thursday, Nov. 15 at the Dallas Arboretum. Green Source DFW editor Julie Thibodeaux said the organization’s recognition is the result of broad public support for the nonprofit. “POP was nominated and selected as a finalist by Green Source DFW readers in a public poll. This shows the community's appreciation for POP's positive leadership and the goodwill the group has generated,” Thibodeaux said. Promise of Peace Gardens operates community gardens in the Dallas area, focused mainly on teaching children about the importance of choosing a healthy lifestyle and caring for both the people and the natural world around us. Elizabeth Dry, founder of Promise of Peace Gardens, in her element. The organization got its start in East Dallas in 2009 with one garden located in a vacant lot along East Grand Avenue near Gaston Avenue. Through the years, the organization has had to pack up and move to avoid high rent or changes in plans by landowners. Dry said the multiple moves have been one of the greatest challenges faced by the organization so far but each time, Promise of Peace Gardens has found an even better arrangement and added locations through the process. Now, the nonprofit operates a garden on the premises of Bayles Elementary School and another next to the Emmanuel Lutheran Community Center, both in East Dallas, along with a garden partnership with LaBajada Urban Youth Farm in the Trinity Groves area in Southwest Dallas. 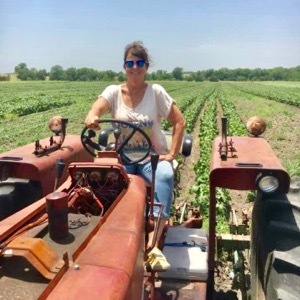 Farm manager Elizabeth Morgan turns soil over in a POP garden. All three gardens are located in areas with poor access to fresh food, also known as a food desert, where a trip to the closest grocery store can involve more than an hour-long round trip by foot or public transportation. To these areas, Promise of Peace Gardens adds more than 2,500 square feet of crop-growing space and produces much-needed fresh fruits and vegetables for the communities nearby while showing participants how they can grow some of their own nourishment. In raised garden beds with a little space dedicated to furrow farming, seasonal crops of leafy greens, beets, peas, green beans, tomatoes, potatoes, herbs and just about everything else that grows well in the area are kept thriving by participating children, their parents and local volunteers under the supervision of Dry and two other part-time farm managers. Most of the work is done on Saturday work days when more than a dozen children and their families show up to tackle the tasks slated for the day. In the garden picking leaves of Swiss chard, gathering a cluster of lemongrass or harvesting green beans with her young helpers, Dry and the farm managers use every opportunity to share the nutritional information for each crop and how it can be prepared for good eating. Informal gardening lessons include knowledge about the soil biome, how plants grow from seed to harvest, meteorology, chemistry, biology and a little bit of everything else that goes along with growing a healthy crop. Once the produce is harvested, the children, their parents and volunteers have a chance to sample their bounty in a weekly social gathering, sometimes outdoors on picnic tables when the weather is nice. The children have become especially fond of using large leafy greens as sandwich wraps, Dry said. “We come together and celebrate at the table. [Recently] I made couscous at home. And then I have a little hand gadget that you can make pesto from the basil so we did couscous topped with some pesto and then some organic crackers. It’s just simple but nutritious, and the main thing is to practice sharing, serving, manners, having positive conversations with one another and also that this can be a healthy snack compared to a bag of chips,” Dry said. The bulk of the produce is shared with local residents who’ve turned out to help at the gardens or who’ve built a relationship with the organization. Ultimately, the food reaches about a hundred people. Dry said that there’s no formal application for anyone to fill out to receive help; an honor system of sorts is in place: those in need take what they need while those with means leave the produce for others. Promise of Peace families pose with with Chefs Suzan Fries and Mynetta Cockerell and POP founder Elizabeth Dry, center to right, after a summer morning working and foraging in Bayles Elementary POP garden. Currently, the program is launching an initiative called Soup It Forward in an attempt to get more of the fresh produce from the gardens to the families nearby, complete with all the fixings to make nutritious soups. At the Emmanuel Lutheran Community Center garden, the produce keeps the center’s food pantry well stocked, feeding the area’s homeless and anyone else who could use a little help, Dry said. Just as important as creating access to whole foods in local food deserts, Dry said the lessons that participating children learn from the gardens affect their lives profoundly. Among the crops, there are no desks or textbooks. 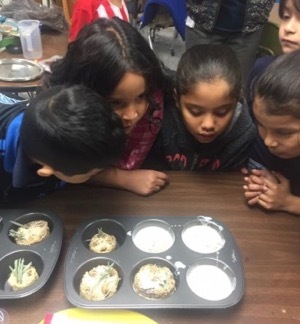 Information about plants, the soil, the ecosystem and how to care for all of it is passed along in conversations while the children work with their mentors, shoulder to shoulder as they pull weeds, sow seeds and harvest the literal fruit of their labor. Dry said the gardens provide solace for the children. The distinctions between haves and have-nots are broken down, as well as prejudices and age barriers. Soon to celebrate its tenth year of operation, Promise of Peace Gardens was conceived when the idea came to Dry as she faced crossroads in her life. She had dedicated herself to public education, climbing the ladder from classroom teacher to principal and even director but increasingly found herself dissatisfied, disillusioned and pessimistic about her work. She said she felt as if she were a part of the problems that children face. POP participants create luffa soap scrubs from the lavender and luffas grown at the gardens. One day on summer break in 2009 while taking a stroll in her neighborhood, she climbed over a chain link fence that was keeping trespassers out of a vacant lot nearby. As she sat in the shade of a large tree on the property, she mulled over her quandary and eventually imagined how the spot where she sat would be a suitable location for a raised bed garden. With her childhood memories of hunting down doodlebugs in her father’s garden and her later experience as a volunteer at the Dallas Arboretum flooding her mind, she thought about how such a garden would be a useful tool for bringing children together to enjoy learning in an outdoor setting. 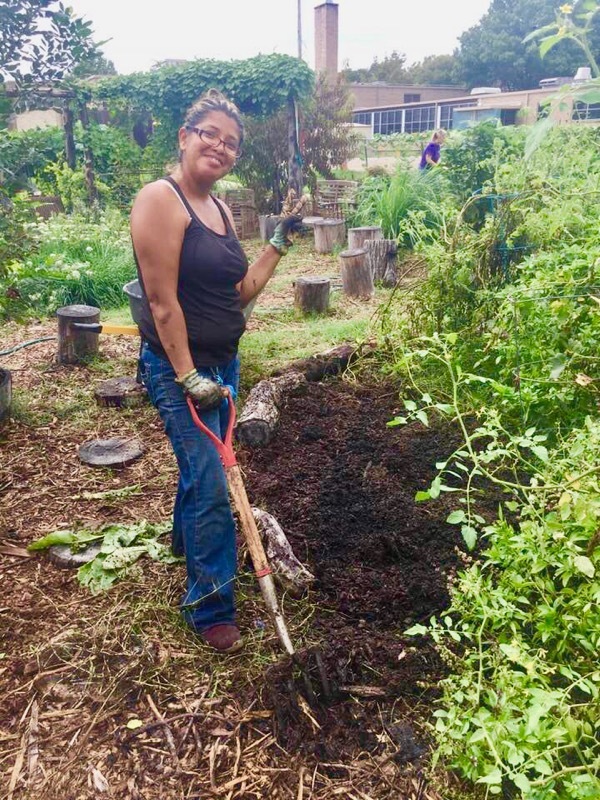 She had heard that the City of Dallas was offering grant money for community improvement programs, so she speculated that a community garden might just be the idea the city was looking for. When she returned home later that day, she casually mentioned her blossoming idea to a neighbor and idly wondered out loud who owned the property. He walked back into his house and moments later emerged with a piece of paper. 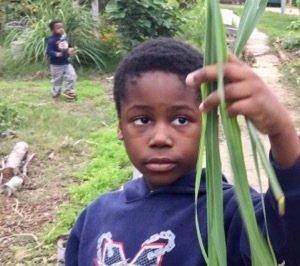 POP participant Obiayma from Africa shows off a harvest of lemongrass. “When he came back out with a phone number for the property owner, I knew that it was a path that I needed to go down. So, in one month we got the lease to the lot and the city grant and established a nonprofit,” Dry said. The name for the new nonprofit organization was equally serendipitous. As a third-grade teacher, she had involved her students in so many charitable fundraisers that one day a student offered that the class should have a name for its efforts and reasoned that raising money for nonprofits and people in need was a sort of promise to them. Another child chimed in that the donations bring peace to people’s lives, thus the name Promise of Peace was proposed. The name stuck with her. 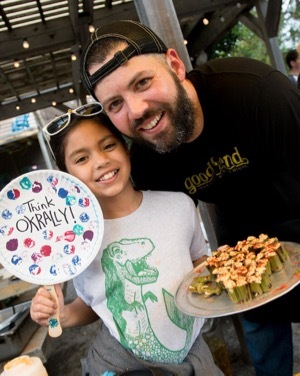 Chef David Pena and his daughter prepare for Okrapalooza 2018, a yearly okra fest that serves as POP’s main fundraising event. After leaving public education in 2016 to give her full attention to Promise of Peace Gardens, Dry said she has now found the fulfillment she sought when she first dedicated her life to educating children. She’s seen how the simple act of tending a garden plot with others helps young minds to develop new ways of thinking and interacting with each other. Where some current classroom norms may enervate students’ imaginations and quash their innate thirst for knowledge, the outdoor garden sparks their curiosity and inspires them to want to learn all they can as they develop problem-solving skills and a hands-on appreciation for the concepts that seem remote and uninteresting when presented on worksheets.